Cancer remains a major challenge for modern society. Not only does cancer rank among the first three causes of mortality in most population groups but also the therapeutic options available for most tumor types are limited. The existing ones have limited efficacy, lack specificity and their administration carry major side effects. Hence the urgent need for novel cancer therapies. One of the most promising avenues in research is the use of specific immunotherapy. The notion that the immune system may have important anti-tumor effects has been around for more than a century now. Every major progress in microbiology and immunology has been immediately followed by attempts to apply the new knowledge to the treatment of cancer. Progress has reached a point where it is well established that most cancer patients mount specific T cell responses against their tumors. The molecular identity of the antigens recognized by anti-tumor T cells has been elucidated and several hundreds of tumor-derived antigenic peptides have been discovered. Upon recognition of such peptides presented by self MHC molecules, both CD8 and CD4 T cells are activated, expand to high numbers and differentiate into effective anti-tumor agents. CD8 T cells directly destroy tumor cells and can cause even large tumors to completely regress in experimental mouse models. These observations have spurred intense research activity aimed at designing and testing cancer vaccines. Over 100 years ago Coley successfully used intratumoral injection of killed bacteria to treat sarcomas. The important anti-tumor effects observed in a fraction of these patients fueled major research efforts. These led to major discoveries in the 80s and the 90s. It turns out that bacterial lipopolysaccharides stimulate the production of massive amounts of a cytokine still known today as tumor necrosis factor (TNF-a). They do so by engagement of a rather complex set of interactions culminating in the ligation of a Toll-like receptor, TLR -4. Ensuing signaling through this receptor initiates potent innate immune responses. Unfortunately the clinical use of both TNF-a and LPS can not be generalized due to their very narrow therapeutic margin. Importantly, synthetic Lipid A analogs have been identified that retain useful bioactivity and yet possess only mild toxicity. The relatively large body of information accumulated thus far on the molecular and cellular interactions set in motion by administration of LPS as well as by the synthetic lipid A analogs allow to place this family of bacterially-derived molecules at the crossroads between innate and adaptive immunity. By virtue of this key position, the therapeutic applications being pursued aim at using these compounds either as direct anti-tumor agents or as vaccine adjuvants. The clinical experience acquired so far on these two avenues is asymmetric. Few clinical trials using Lipid A analogs as single anti-cancer agents involving less than 100 patients with advanced cancer have been reported. In contrast, lipid A has been tested in over 300,000 individuals in various vaccines trials, including therapeutic cancer vaccines. Clearly most of the work needed to develop lipid A as effective anti-cancer agents and/or as vaccine adjuvant lies ahead in the near future. 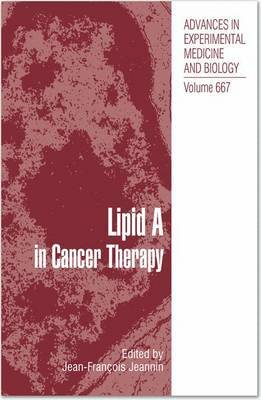 This book is a timely contribution and provides a much needed up-to-date overview of the chemical, biological and physiological aspects of lipid A. It should be a beacon to all those involved in this field of research.